Treasure-packed and with 5 different Free Spins modes, Dwarf Mine is a 5-reel 3-row video slot machine where its producer Yggdrasil promises a maximum of 16.807 ways for future winners to score a big win of 488.025 coins – courtesy of the Expanding Machine feature. First-timers are welcomed with a significant boost helping them trigger Collection Free Spins feature with Super High Paying Symbols faster. Find out what’s deep under the ground after reading the Dwarf Mine slot review. Want to see how Dwarf Mine works? Select a recommended casino site from the list below and start playing for free or real – our screenshots will give you a sneak peek! We can say the game has 2 different modes and we don’t talk about the classic selection where a player is asked to define will he or she play for fun or for real money. Here, the base game comes with 5 reels, 3 rows, and 1024 betways, but the Dwarf Mine Bonus mode expands the layout to a 5-reeler with 7 rows and no less than 16.807 paylines. More than 1 icon on one reel grants a Multiplier applied to the overall score. If this set of rules sounds like a challenge on the first hearing, we suggest you try the Dwarf Mine Free Play mode first and spend all demo credits to learn how to win. New players will be warmly welcomed with 8 Collectible Crystals as a jumpstart feature. In other terms, this is a standard game that pays from the leftmost presuming you already formed a winning combination with 3+ matching icons. The paytable puts much trust in gems of all sorts and kinds, each with a different payout rating. Helmet, Pickaxe, Lantern and Shovel pay between 10 and 35 coins for combinations of 3 to 5 of a kind. Lower-paying icons represent suits of playing cards and may bring 5 to 15 coins for at least 3 and a maximum of 5 matching suits. The coin value ranges from €0.004 up to €5, allowing you to wager between €0.10 and €125 per round, according to your gaming experience and betting strategy. When playing for free, you will receive demo credits for any given purpose, but their denomination remains the same. Each Bonus Symbol landed on the reels expands the layout for 1 row up to the maximum of 8. 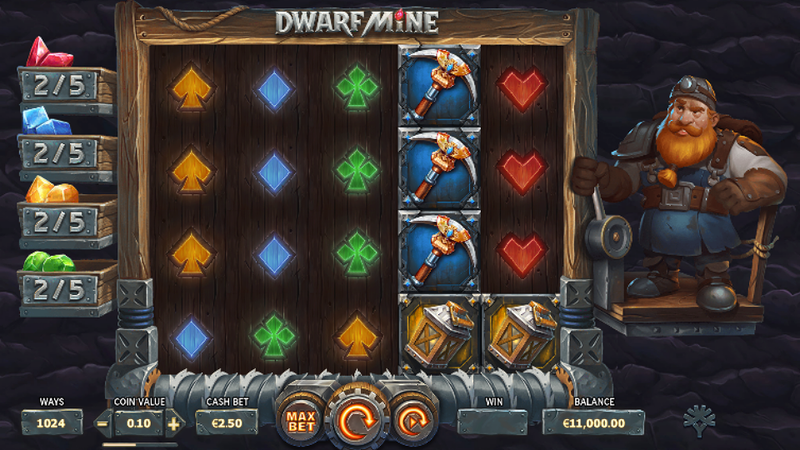 When 3 Bonus Symbols land anywhere on the reels, you will receive 10 Dwarf Mine Free Spins playable on a fully-extended layout. On the other side, collecting 5 of each kind trigger the appropriate Collection Free Spins feature with Super High Paying Symbols. This is where you can earn between 25 and 100 coins for 2 to 5 matching items. You can play online using any mobile device on Yggdrasil sites. There is no need to download the iPhone app or the Android .apk file. 3. What is the RTP factor of Dwarf Mine? The official RTP info states the figure of 96.80% and is added to our Dwarf Mine tutorial. An original take from a familiar theme comes with a fresh new breeze of attractive and rewarding features. With the Dwarf Mine tips gathered here, your winning odds will be much higher, but remember the game is challenging, even though high rollers won’t be attracted with the prize pool.